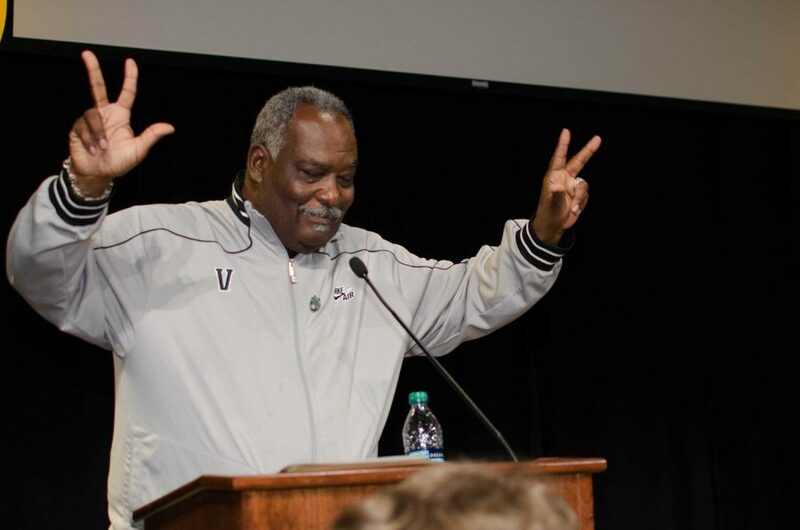 David Williams holds up the VU hand sign during Vanderbilt's bowl announcement celebration on 12-2-12 in the SLC. On Friday, Feb. 15, former Vanderbilt Athletic Director David Williams, who tragically died last week at the age of 71, will be honored at a memorial service here in Nashville. Since his passing, countless tributes have poured in about his life and his legacy as a family man and a Vanderbilt Man. 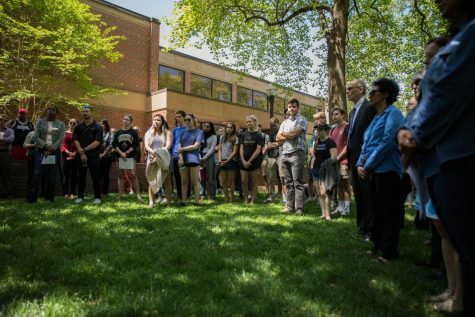 This week, we spoke with Williams’ former colleagues, friends and student-athletes about what he meant to them. They also shared some of their favorite stories about Williams. “When the voice and commentary got loud, that’s when David was at his best. Coming off of a tough first season, you had an athletic director take off his athletic director’s cap and try to sit down with a first-time head coach and figure out what was necessary to get to the other side. He listened to everything that I had to say, and he said to me that it’s not about being right, it’s about getting it right. His biggest impact to me was about how he felt about student athletes. For one, Turner Cockrell and his experience here and his battle with cancer. There was no bigger advocate for the Cockrell family and Turner Cockrell than David Williams. Whether it was flying the family to Houston to go to a private clinic and see about getting better treatment or experimental treatments when things starting to worsen rapidly, or him hearing of what was happening with Turner and putting me on a jet and flying me down to see Turner 48 hours before he passed away. David looked at the arrangements for Turner’s funeral and made sure that we all flew down to Atlanta to be at the family’s services. David was always at his best in big moments. I can remember when Donaven Tennyson lost his father, and Donaven had been here only two weeks as freshman. I can remember Donaven’s father’s last words to me were to make sure that I take care of his son, and that’s what we committed to do. Myself, David, and my wife got on a plane to get Donaven back to Richmond, Virginia, to try to help pack up his father’s place. Not everybody agreed with how he saw athletics, but the way he saw athletics for the athletes was extremely pure. It was about serving athletes. It was about doing our best to make sure that we resource these young people the right way. He always was big on coaches being at graduation. That was huge to him because not only did he want you to usher them in, but he wanted you to see them on their way as they cross the stage. “It changes everything to have a man of integrity, a man of great wisdom, a man who helped make Nashville and Vanderbilt feel like home. That’s what David was able to do for me. Over the course of my professional career, David was someone that I would call often for advice. There were very few decisions that I made where I didn’t ask for his input first. He has been that role model to me for many years. I trusted him and I trusted the advice he gave. When I first moved back to Nashville, I was really nervous about what a career outside of basketball would look like. 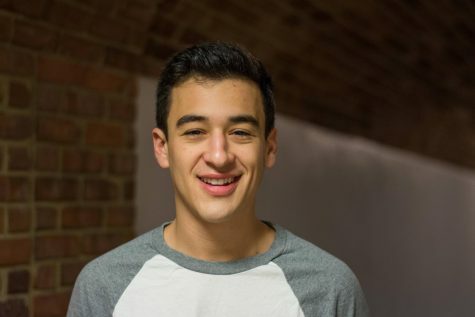 I reached out to David and just said, you know, ‘Hey, I would really love to come work at Vanderbilt and I could do anything, it doesn’t really matter.’ And David, because of our relationship, just said, ‘We could get you a job at Vanderbilt and that would be great because people would just love you being around. 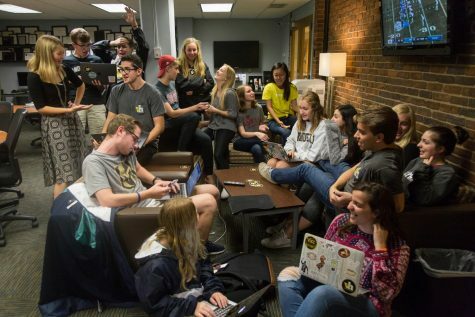 But what do you bring to the table and how will you have the ability to really galvanize this community and do something that will have a much greater impact than you just working at Vanderbilt?’ I knew I didn’t have a lot of work experience, I didn’t have the credentials to get something that was in a higher-up position. He just saw something more in me. He saw something greater that perhaps I didn’t even see in myself. “The first thing I think about David, is that he was the champion of the underdog. I think he saw himself as an underdog. He was always looking for the students that didn’t quite fit in, and advocated for them or encouraged his staff to advocate for them. I’m thinking from religious perspectives, race perspectives, cultural and societal perspectives. It wasn’t a matter of, you know, look, there’s 100 students and 99 of them are this way or look this way, he was always thinking about the one. Because of that, we were way ahead of most of our colleagues on diversity matters. We had a diversity committee in the athletics department well ahead of most of the departments on campus. There might even be places on campus that still don’t even have them. We were talking about the issues when I was a member of that committee, so I know exactly what we talked about. We talked about what it would be like to be Jewish on our campus, or what it would be like to be a different race, or gender. We talked about all sorts of things, so we were way ahead on that curve. The other thing, a little bit along that line, is that with his legal mind we talked a lot in our staff meetings about issues, pending NCAA legislation and what would be the pros and cons. I always thought, when I went to a national or a conference meeting, that I was better informed on the topics than a lot of my colleagues, even from super universities, because they didn’t have a leader that was so sharp on the matters of policies. That served us so well, because we were able to plan ahead and anticipate things that might be surprising at other campuses. “David was really good to me in a lot of different ways. My third year in the program after I had come from the University of Arizona, I had a player die while we were at the 2010 national championship. David helped me get from Wilmington, North Carolina, to Orange County, California, and back for that funeral, and I only had to miss one day of the championship. David did that because he knew we were all about family, and he wanted me to be there for that funeral. [On his last day as AD], we were leaving the next day for our first tournament of the spring, so I sat down with him in his office and talked to him for five minutes. I thanked him for bringing me to Vanderbilt because what it did is it allowed me to bring my family closer to where I grew up and allowed my mom and dad to see their grandkids grow up. I also thanked him for taking care of me during personal times when it was very difficult. “When I first met him as a freshman, he was this larger-than-life guy. The first time he talked to us as a freshman class, we could tell he cared about the student-athletes. 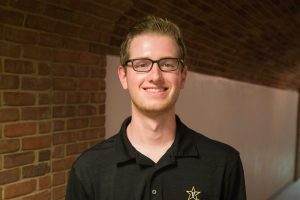 As my experience at Vanderbilt progressed, and I joined organizations, he came to events and participated in events. His door was just always open. He was always willing to talk to us. Perry Wallace during Vanderbilt’s 66-63 loss against Baylor at Memorial Gym Nashville, TN December 4, 2014. 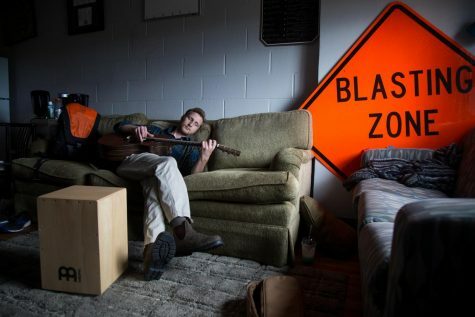 “One of my first interactions with David is when I was working on Strong Inside and I came to his office to interview him about the work that he had done to help bring Perry back into the fold at Vanderbilt. We had a great conversation and he was very honest and open about the resistance that he encountered from some people towards Perry Wallace, and how he felt that it was just unbelievable. For context, when Perry graduated in 1970, he gave an interview to The Tennessean where he talked openly about the racism that he encountered on campus. Following that story, is when the relationship between Nashville and Perry kind of deteriorated. People thought he was angry, when really all he was doing was telling the truth. 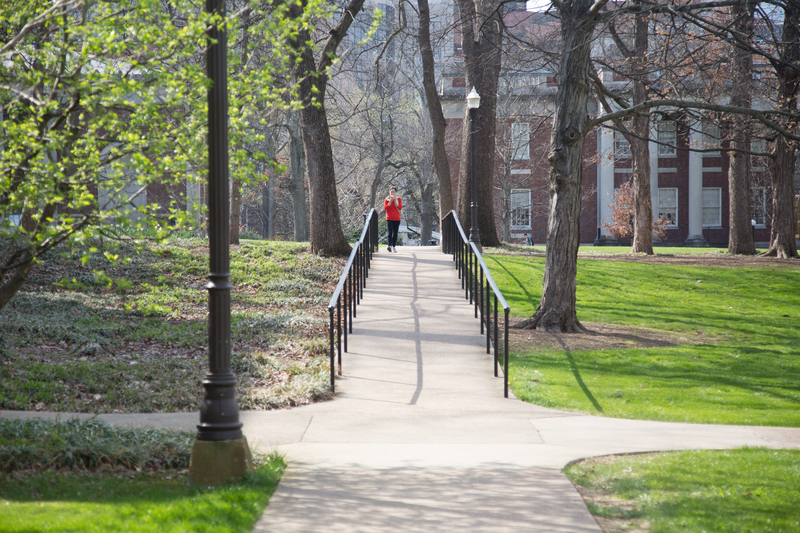 He wasn’t ever even invited back to this campus until 1989, almost 20 years after he graduated. Following that, he had opportunities to come back to campus, but it still was not a case of us as a school really embracing Perry, telling his story, and being proud that we had the first black athlete in the SEC. David, however, took it upon himself to change that. 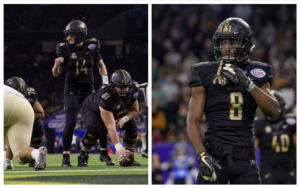 He wanted to not just embrace the story, but also completely rebuild the relationship between Perry and Vanderbilt. He was approached by some students who wanted to honor Perry in some way, and he worked with them to come up with honoring him through retiring his number. That was an important symbolic gesture to do that, but also it showed that Vanderbilt was claiming this story the way they should. 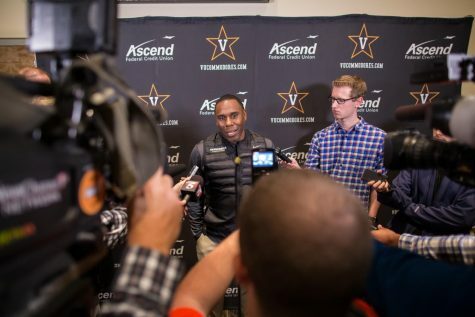 When all is said and done, I don’t think you can look at his tenure as athletic director and not say, ‘This was the most successful time in Vanderbilt athletics, across the board, in school history, and for so many reasons.’ He solidified people’s perception of Vanderbilt athletics as a place that does things the right way. 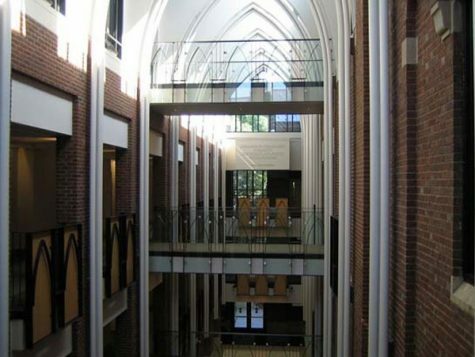 No question that we really believe in student athletes getting their own education, being real students, and having the opportunity to get to travel abroad, and to have internships, and I think that brand of Vanderbilt as a place that thinks about athletics in the proper context, that’s a big part of his legacy. Vanderbilt Spring Game March 25, 2016 at Vanderbilt Stadium. Photo by Bosley Jarrett. “He went all out to find out what we could do best. I think all of the people who worked under him appreciated how much he wanted to do to get that whole department going again. Really, coaches appreciate that. Anybody that reaches out to young people, they’ll appreciate it, and that certainly was the thing that was going on with David and all the student-athletes. The other thing David did was he worked really hard for us in recruiting. 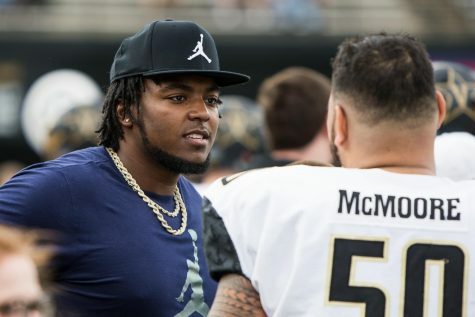 I think we had a weekend recruiting situations and tried to get five or six guys to come back from somewhere else and say ‘no, I’m going to Vanderbilt.’ He would put on a great speech about what it means to go to Vanderbilt and what what we’re going to do to make it better here. It worked. It got better. [The 2008 Music City Bowl win] was great. 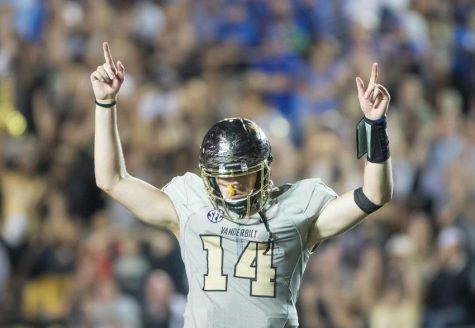 I think he was having as much fun as we were just going through the practices every day, the whole process to get to the game, and then actually going through it and winning a great victory for Vanderbilt. “I didn’t end up getting to meet him until I first stepped on campus that summer before freshman year when all of the athletes reported. He spoke to our recruiting class, all of the new guys, and introduced himself individually to each one of us. That was the first time I got to meet him.He was at every single game for the most part that we had, I would see him on the sidelines and we’d talk briefly. We’re definitely a smaller-knit athletics department, and I think that has its good side and bad side. The good side of that is our AD got to know and recognize every single athlete, no matter what sport you were in. Mr. Williams was definitely one of those guys who really cared about your off-the-field development, and that’s not something you usually see, especially within the SEC. You kind of get treated as primarily an athlete and a student second. But in our department, which was the result of Mr. Williams’ leadership, you were really a student first and athletics was just something you did while you were at school. That was a big benefit for us. He was pretty big in the conception of the summer internship program that Vanderbilt was really the spearhead for that for a lot of schools. I don’t know for sure, but I’m pretty sure that was his masterpiece from the very beginning. That just helps out a lot of the football players. We get that professional experience over the summer instead of just attending summer class and working out, kind of diversifying your experience at school and letting you see what kind of stuff you might be interested in in the real world. He definitely took the time to provide these opportunities. There was money allocated to send athletes on Maymesters abroad. It’s just not stuff you normally hear about going on at schools, but he made it a point to do. “My first interaction with him was actually on my official visit here at Vanderbilt. I was only a senior in high school, and I met with David along with both my parents. He was, from the jump, an extremely impressive person. He truly and genuinely cared about the well-being and development of every student-athlete on campus. A lot of us athletes have to arrive well before our fall semester starts as a freshman, and I think the relationships with them started then. He set up a number of workshops and seminars for all the freshmen student-athletes, and once a week he would come in and sit down, then be open for questions about anything. 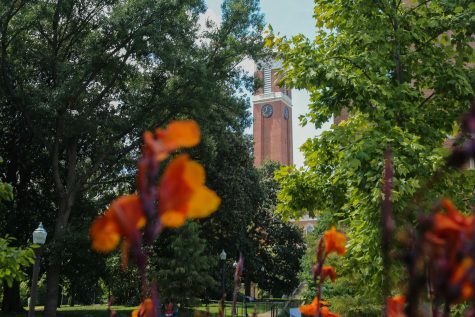 Life, academics, sports, Vanderbilt, anything at all; the minute you stepped on campus he wanted you to know he was available for everything and anything you needed. I was part of the student athlete advisory committee, which takes two students from every team and meets once every other week. I was a part of it as a senior, and I remember we had a meeting at like 8 or 9 PM on a Wednesday night, he stopped in at our meeting and asked what we were going through as student athletes, what our lives were like, what we needed help with, and what we might have been struggling with. He was just always there to make our lives better on the field, off the field, and in the classroom. Obviously we went through a coaching change, and when that happened, we were all not sure what direction things were going to go. It’s an unfamiliar situation for almost everyone, but he sat us down right when we found out Coach Stallings was leaving. He wanted to ask for our input. He wanted to make sure we felt comfortable and he let us know that he was still here for us in support of us. The first thing that comes to mind when I talk about his legacy is that he never put himself first. He always always always looked out for the betterment of the student athletes both on and off the field. He was always asking and inquiring of things that would make our lives easier, help us perform better, and take us to the next level. He was just such a genuine and caring person and he really made you feel welcomed, and made you feel special, from the moment you walked on campus. I think you can see that by just looking at social media.